The IRS reminds taxpayers looking to maximize their tax savings before the end of the year to consider charitable giving. The IRS today reminded employers and other businesses of the Jan. 31 filing deadline that now applies to filing wage statements and independent contractor forms with the government. The IRS today advised taxpayers about steps they can take now to ensure smooth processing of their 2017 tax return and avoid a delay in getting their refund next year. 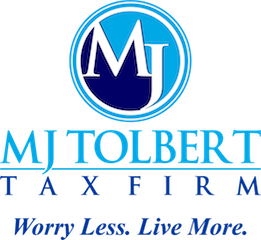 MJ Tolbert Tax Firm, LLC is a full service tax firm specializing in getting our clients a maximum refund. We've been serving Columbus, GA and surrounding areas for 12 years. Our trusted team of Tax Consultants is committed to providing you with the highest degree of professional services. We are continuously educating our staff on the ever-changing tax laws to ensure our clients are receiving the superlative service they deserve. We guarantee proficient and honest tax services and remarkable results. Our years of experience and notable expertise ensures that your tax preparation is in good hands.